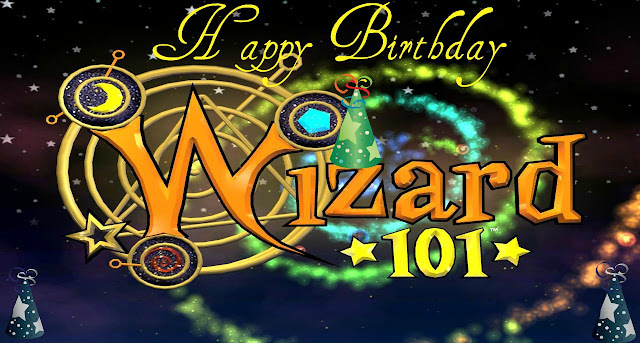 Around the Spiral with Edward Lifegem: Happy 3rd Birthday Wizard101! I am sure most do know today is Wizard101's 3rd birthday! I am glad I am here to celebrate wizard101's birthday. I am also glad I joined the best online game ever! When I say the best online game ever, I mean wizard101 is probably going to be the best game you could ever play online, even 20 years from now. I am sure Wizard101 will have a lot more playing then than today. I would like to tell you more of my favorite things about Wizard101- different from the blog post from the other day. I have so many things I could mention that would be my favorite thing about Wizard101 it could go on for a lot of blog posts. I really do like making friends on Wizard101, I have made a lot of friends on the game since Wizard101's second birthday. Another favorite thing would be my blog, I would have never made a blog about Wizard101 if it wasn't a game I really didn't like. I love this game, that's why I made a blog about it! Another thing that kinda has something do with friends is that you can make great friends on here that you will never forget in your lifetime. I have made a lot of great friends on the game and I am glad to have you as friends, that counts people on Facebook, twitter, and my list on Wizard101 :) More things I like about this game is that well, I said that in the introduction. Its' the best game online!!! I have never played such a game that has been something I have been playing for 2 years already! I am glad I did see the commercial for Wizard101 or I wouldn't be making this blog post right now, or have made great friends on the game. So my favorite thing out of the blog and friends would most likely be making good friends on Wizard101. Other things could include the graphics in the game, feeling like you are Harry Potter, or just having somewhere to hang out when you are bored. Well I made a poster for Wizard101, and I am not good at posters so don't laugh :) Here it is!